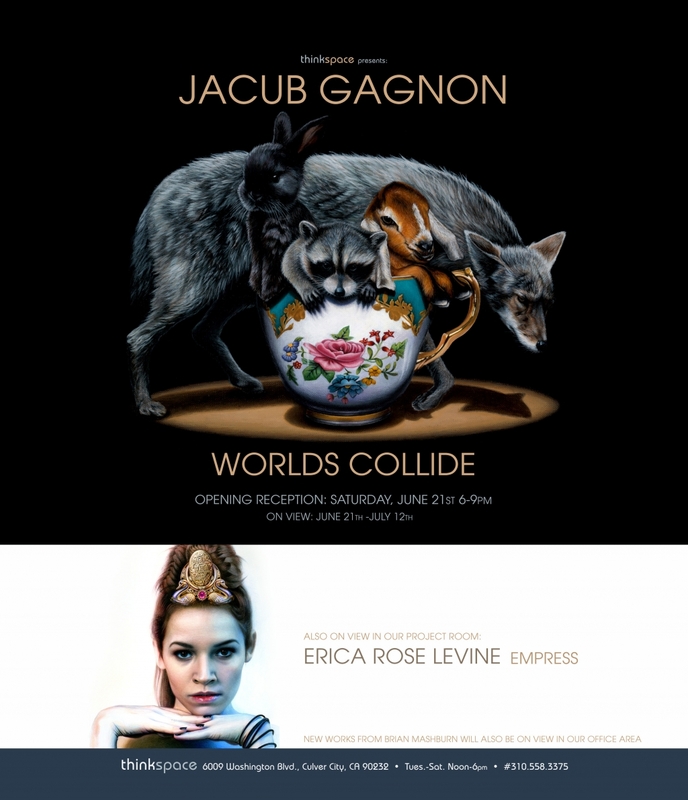 Thinkspace (Los Angeles) – is pleased to present Worlds Collide, featuring new works by Toronto based artist Jacub Gagnon. Gagnon’s technically meticulous paintings of fauna deliver playful and incongruous imagery with a singular precision. An artist with an impressive penchant for detail, Gagnon’s fantastic paintings of animals and human objects are staged as deliberately illogical, albeit playful, encounters. He creates these exacting works with minute brushes and the painstaking application of acrylic layers, handling the brush with the purposed control of a pencil. His paintings seductively integrate the naturalist’s attention to minutiae with the free imaginative reign of the surrealist. With a unique finesse for the posturing of unlikely relationships, Gagnon stages beautifully disquieting tensions between the artificial and the natural, the spontaneous and the propped, and the plausible and the absurd. The stark visual contrasts in Gagnon’s works are undeniably effective. 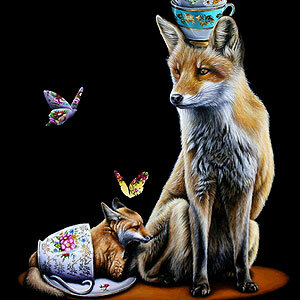 Relying on an ambiguous chasmic black space as background, and a dramatic spotlight effect to illuminate the foreground, the rendering of his animals and objects become excessively realistic despite their often miniaturist proportions. The theatricality of these compositional devices, and the artist’s ability to confuse and confound scale and representational accuracy, further excise his imagery from the restrictions of the familiar. While often innocuous and recognizable, Gagnon’s imagery derives its impact from its recombination and discordant staging. The artist’s world is replete with wonderfully bizarre encounters and clever juxtapositions: an otherworldly realm of creature play inspired by free association. At once whimsical and disconcerting, the artist’s playful appropriation of the animal world draws attention to the reality of its fragility and misuse. The poetry of Gagnon’s work thrives in the irresolution of these tensions. Ambiguously beautiful and vaguely threatened, realistically rendered and undeniably impossible: worlds collide in infinite black space.